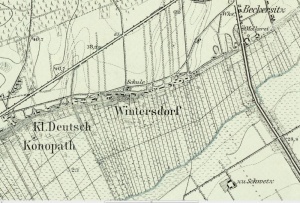 Detailed map of Przechovka (Wintersdorf), 1906. Przechovka (also known as Przechowka, Przechowko, Przechowken, Klein Przechowo, Przysierk, Schighofke, and Wintersdorf after 1875 until World War I, and now Przechówko; coordinates: 53.39031, 18.38589 [53° 23' 25.1" N, 18° 23' 9.2" E]; population in 1910, 92), Poland, was formerly the seat of an Old Flemish congregation, the mother congregation of the Brenkenhoffswalde congregation in the Netzebruch and of Alexanderwohl and Gnadenfeld, the leading congregations in the Molotschna Mennonite settlement. It was situated inland from the villages of Deutsch-Konopath and Divorczieka (German, Wilhelmsmark) and along the Vistula River with the villages of Glugovka, Kossovo, and Christkovo (German, Christfelde), 3 km (2 mi.) south-west of Schwetz (now Świecie) with Ostrov (German, Ehrenthal) up the Vistula in the Klein-Schwetz marsh, south of the Frisian communities of Montau-Gruppe and Schönsee. In 2013 Przechówko was a village in the administrative district of Gmina Świecie, within Świecie County, Kuyavian-Pomeranian Voivodeship. Przechovka and Divorczieska were royal villages, Deutsch-Konopath, Kossovo, and Christkovo noble villages, Glugovka part royal and part noble. The settlements are thought to have originated about 1540; in 1661 they were a part of the Groningen Old Flemish Sociëteit, which held most tenaciously to the old traditions. In the 18th century there were settlements of Old Flemish to the northwest in the noble villages of Jeziorka (German, Kleinsee), straight north in Tuchel, and northeast across the Vistula in Schönsee, Posterwolde, Horst, Ausmass, Jamerau, and Dorposch. The estate of Przechovka was originally sold to five Mennonites from the Netherlands by the heirs of a Polish nobleman; these settlers attracted other Anabaptists, so that the village community finally embraced 15 home sites. The first contract of lease was granted to the village in 1642 for 50 years. In 1653 there was an association of Dutch inhabitants for the support of the schoolteacher, the burial of members of other faiths; in 1668 a "Manist Johannes" touched his breast as affirmation instead of an oath. The privilege granted by John II Casimir was confirmed a number of times; on 9 February 1672, it was confirmed expressly for Przechovka, Kossovo, and Christkovo. In general, children were not counted, especially by Derks. At Deutsch-Konopath there were Lutherans living among the Mennonites. The most common Mennonite names were Ratzlaff, Unrau, Becker, Voht, Nachtigal, Wedel, Schmidt, Koehn, Pankratz, Sparling, Frey, and Buller. Hulshoff, whose diary of 1719 is extant, stayed at Przechovka 5-17 July, and on the other side of the Vistula in Posterwolde and Schönsee 18-29 July. On Sunday, 9 July, Wednesday, 19 July, and Tuesday, 25 July, he preached on Ephesians 6:11-13, Hebrews 1, and on the fruits of the Spirit in general. On Thursday, 13 July, two preachers, Abraham Unrau in Przechovka and Jakob Isaaks in Posterwolde, were chosen, and on the following Sunday confirmed. On a Sunday they observed feetwashing. One or two days before the official actions Hulshoff spent "with the books." The Polish brethren had requested the Dutch to send them Biestkens Bibles, old hymnals, martyr books, and Menno Simons' and Dirk Philips' works. The joy caused by their visit is mentioned several times. Rye was at that time the outstanding crop. In 1738 and 1765 collections were again taken among the Dutch Mennonites for those in this region. The Dutch Naamlijst of 1742-1802 and the German Namensverzeichnis of 1759-1805 give the following names of elders and preachers: Benjamin Wedel, elder before 1719-ca. 1747; another Benjamin Wedel (grandson of the former? ), preacher? elder 1747-1785; Jacob Wedel, preacher 1779, elder 1785-1791; Abraham Richert, preacher 1785, elder 1791-1799; Benjamin Wedel, preacher 1791, elder 1799-? ; and the following preachers: Jacob Isaac, d. before 1755; Hans Voet (Voht, Foth) 1719-after 1755; Abraham Unrau ca 1723-ca 1760; Peter Ratzlaff, before 1743-ca 1780; Jacob Wedel 1747-1765; Laurens Sparling 1718-? ; Ernst Schmidt (Smit) ca 1760-1775; Jacob Schmidt (Smit) ca 1765-1774; Hans Ratzlaff ca 1765-? ; Heinrich Unrau 1779-? ; Andreas Pankratz 1785-? ; Heinrich Ratzlaff 1791-? ; Hans Unrau 1799-?. The first recorded elder was Berent Ratzlaff (b. ca. 1660). The 1776 Prussian census lists 19 Mennonite families in Przechovka with the following surnames: Becker, Funck, Harpart, Knels, Pankratz, Ratzlaff, Richert, Schmidt, Unrau, and Wedel(l). Under the leadership of Peter Wedel and Heinrich Buller most of the Mennonites left in the Schwetz area immigrated to the Molotschna Mennonite settlement in Russia in 1819-1820 and 1823-1824, and founded the Alexanderwohl congregation. Concerning the end of the congregation Stobbe reports: "The meetinghouse was in the present school yard. . . . In 1832, when the town of Przechovka built its own school and wanted to rebuild the Mennonite meetinghouse for that purpose, the few remaining Mennonites opposed the move and sold it to be dismantled. What happened to the meetinghouse cannot be ascertained, since the records of the town were destroyed by a fire in 1857. The last elder was a Richart and lived in Deutsch-Konopath. The congregation that at the end of the 18th century had about 300 members was extinct by about 1830. The few remaining old Flemish united with the Frisians in 1849. "Familienforschung in Westpreußen." Hans-Jürgen Wolf. Web. 29 September 2012. http://www.westpreussen.de/cms/ct/ortsverzeichnis/details.php?ID=7002. Friesen, Peter M. Die Alt-Evangelische Mennonitische Brüderschaft in Russland (1789-1910) im Rahmen der mennonitischen Gesamtgeschichte. Halbstadt: Verlagsgesellschaft "Raduga", 1911: 90. Hege, Christian and Christian Neff. Mennonitisches Lexikon, 4 vols. Frankfurt & Weierhof: Hege; Karlsruhe: Schneider, 1913-1967: v. III, 404-407. Hoop Scheffer, Jacob Gijsbert de. Inventaris der Archiefstukken berustende bij de Vereenigde Doopsgezinde Gemeente to Amsterdam, 2 vols. Amsterdam: Uitgegeven en ten geschenke aangeboden door den Kerkeraad dier Gemeente, 1883-1884: v. I, 1702; v. II, 2, Nos. 738, 740. Hulshoff, H. Ch. "Bezoekreis van Hendrik Berents Hulshoff aan de Doopsgezinde gemeenten der Oude Vlamingen in Pruisen en Polen in 1719." Bijdragen en Mededeelingen van het Historisch Genootschap (1938): 32-82. Leopold, Georg, Freiherr von Reiswitz and Friedrich Wadzeck. Beiträge zur Kenntniss der Mennoniten-Gemeinden in Europa und America. Berlin, 1821. Maercker, Hans. "Eine polnische Starostei und ein preussischer Landratskreis. Geschichte des Schwetzer Kreises 1466-1873," in Richard Wegner, Geschichte des Schwetzer Kreises II, in Zeitschrift des Westpreussischen Geschichtsvereins 17-19 (1886, 1887, 1888). Mannhardt, Wilhelm. Die Wehrfreiheit der altpreußischen Mennoniten: Eine geschichtliche Erörterung. Marienburg : Hempel in Komm., 1863. M(eissner), (August Gottlieb). Leben Franz Balthasar Schönberg von Brenkenhof. (Leipzig, 1782). Mennonitische Blätter (1918): 93; (1919): 5, 10, 36, 37, 55, 80. Paczkowski, Józef. Opis królewsczyn w wosewodztwach Cheminskim, Pomorskim i Malborskim w roku 1664. (Societas Literaria Toruniensis, Fontes 32). Torun, 1938: 237, 246. Penner, Horst. "Die Westpreussischen Mennoniten im Wandel der Zeiten. "Mennonitischer Gemeinde-Kalender 7 (1950): 17-31. Stobbe, Leonhard. Montau-Gruppe. Montau and Gruppe, 1918. Szper, Felicia Nederlandsche nederzettingen in West-Pruisen gedurende den poolschen tijd. Enkhuizen, 1913. Unruh, B. H. "Die Mennoniten in der Neumark." Mennonitischer Gemeinde-Kalender (1941): 58-76. Wiebe, Herbert. Das Siedlungswerk niederländischer Mennoniten im Weichseltal zwischen Fordon und Weissenberg bis zum Ausgang des 18. Jahrhunderts. Marburg, 1952. The scanned church records for Przechovka may be seen at Mennonite Library and Archives (North Newton, Kansas). Crous, Ernst and Richard D. Thiessen. "Przechovka (Kuyavian-Pomeranian Voivodeship, Poland)." Global Anabaptist Mennonite Encyclopedia Online. March 2013. Web. 18 Apr 2019. http://gameo.org/index.php?title=Przechovka_(Kuyavian-Pomeranian_Voivodeship,_Poland)&oldid=146069. Crous, Ernst and Richard D. Thiessen. (March 2013). Przechovka (Kuyavian-Pomeranian Voivodeship, Poland). Global Anabaptist Mennonite Encyclopedia Online. Retrieved 18 April 2019, from http://gameo.org/index.php?title=Przechovka_(Kuyavian-Pomeranian_Voivodeship,_Poland)&oldid=146069. Adapted by permission of Herald Press, Harrisonburg, Virginia, from Mennonite Encyclopedia, Vol. 4, pp. 225-226, 1147. All rights reserved.